Although I have been going to Providence for nearly two years for a client, amazingly enough this was my first visit to WaterFire (why oh why did I miss Prof. Frenchman’s class trip during grad school over a decade ago?!). It was an incredible experience that only served to reinforce the power of thoughtful planning and infrastructure investment. 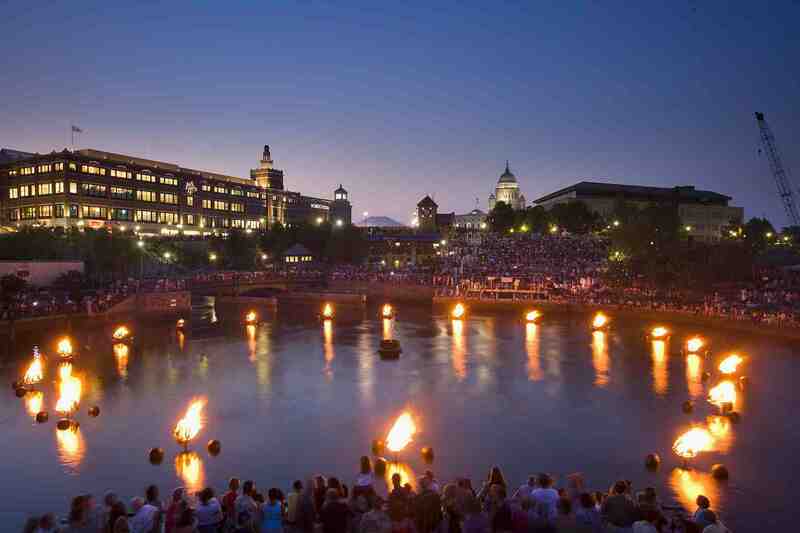 For communities considering investments both big and small in public space, WaterFire provides an example of how public space, when designed correctly, can offer artists a “stage” for their creativity and enliven a downtown with activity and visitation that creates some serious economic impact. In this case, the “stage” took the form of the daylit, and previously buried, Providence River. The project to bring the river back took ten years and nearly $60 million dollars, and included the removal of bridges and roadways that has obscured the river for decades. While daylighting was not done precisely for WaterFire, it might as well have been. The river and its surroundings we perfectly positioned to served as an inspiration for a piece of performance art that is credited with significant economic impact on downtown businesses. For those who don’t know what Waterfire is, it is a live performance and art exhibit and the brainchild of Barnaby Evans. During the evenings in warmer months from April to November, a series of floating bonfires burn in the middle of the river. These fires are continually fed fresh wood by black clad volunteers in small gondolas. The event began in 1994 to celebrate First Friday’s in downtown Providence. My tour guide for the evening was friend and colleague Frank Latorre, of the Providence Downtown Improvement District, whose efforts to keep downtown lush, planted, green, clean and safe have also played a significant role in the downtown renaissance As we walked, Frank bumped into some friends and colleagues (the benefits of small city living! ), including Barnaby Evans, the creator of WaterFire, and his head fundraiser, Bronwyn Dannenfelser. Chatting with Bronwyn about the event offered me unique insight into what makes WaterFire so special – and perhaps more difficult to replicate than many might think. The proximity of the bonfires to the river paths create a dynamic interplay that touches every sense – visitors are close enough smell the burning cedar and smoke, hear the wonderful international music that wafts through the air, see the visuals of volunteers calmly stoking the fires on still waters and the reflection of the flames. The exact public infrastructure that lends itself so well to WaterFire is difficult to replicate elsewhere without tweaks to the concept. That said, it works in Providence and the restaurants and bars that line the River could not be happier. Visitors now come to Providence from near and far to see the extraordinary event and spend their money at hotels, stores and dining establishments. The main lesson here is perhaps less about WaterFire than it is about the absolutely transformative effect, and sometimes unexpected but wonderfully creative outcomes, that emerge from a well designed public space. Communities far and wide should look to create not just any open space, but open space that creates economic development opportunity by offering a dynamic interplay between public space, arts activities and local businesses.